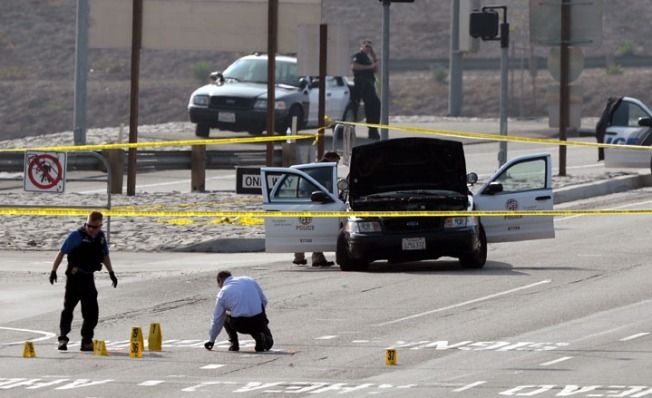 Police Chief: Ex-LAPD Revenge Shooter "Knows What He's Doing"
Police investigators inspect bullet riddled Los Angeles Police Department squad car where a police officer was shot on Magnolia Ave. over the Interstate 15 Freeway on February 7, 2013 in Corona, California. Former Los Angeles police officer Christopher Jordan Dorner, 33, who had allegedly warned he would target law enforcement, is suspected of firing on two LAPD officers and ambushing two other officers, killing one. Dorner is also a suspect in two weekend killings of Monica Quan and Keith Lawrence who were found dead in a car inside a parking structure. Christopher Dorner, the man suspected in a series of murderous revenge attacks on police officers and their families, has a long military and law enforcement background that gives him an unusual expertise in firearms. The 33-year-old spent 10 years in the U.S. Navy Reserves – rising to the rank of lieutenant before receiving an honorable discharge last week. And he spent eight years at the Los Angeles Police Department, working as an officer in at least two divisions until he was removed from service in 2008. "Of course he knows what he’s doing," Los Angeles Police Chief Charlie Beck said as the manhunt for Dorner heated up on Thursday. "We trained him." Dorner received a Rifle Marksman Ribbon and a Pistol Expert Medal, and he was highly schooled in the use of a variety of weapons while at the LAPD. In a 11,400-word manifesto published online, he repeatedly used military and law enforcement terminology to describe his strategy for hunting down police officers who he believed betrayed him, along with their families. Patrolling officers who recognize his vehicle, he warned, should not confront him. Navy spokeswoman Lt. Cmdr. Cate Cook said Dorner was not a sniper in the military, as some reports have contended. But he was highly skilled. On Thursday, when a two-person LAPD detail assigned to protect some of the people he had threatened tracked him down in Corona, Calif., Dorner fired at their car, Beck said. He missed killing one of the officers by inches or less, grazing him on the head, and shot up their patrol car so badly that they were unable to follow him any further. With the officers unable to pursue him, Dorner then went to nearby Riverside, where he shot two of the inland city’s officers as they sat in their patrol car at a red light, Riverside police Lt. Guy Toussaint said. In a passage of the manifesto that hints alarmingly at his deep knowledge of weaponry, yet is riddled with grammatical and punctuation errors, Dorner also bragged that his knowledge of the legal system had enabled him to purchase guns illegally. "Are you aware that I obtained class III weapons (suppressors) without a background check...?" he wrote. "I was able to use a trust account that I created on quicken will maker and a $10 notary charge at a mailbox etc. to obtain them legally." Dorner’s shooting spree began Sunday night, when he gunned down the daughter of the police union lawyer who had represented him in an internal investigation. Monica Quan and her fiancé, Keith Lawrence, were found slumped in their car on the top floor of the parking garage at the Irvine condominium complext where they lived. In that case, Dorner was terminated for filing a brutality report against a colleague that officials later determined was false. He filed a lawsuit against the LAPD claiming he was treated unfairly, but the suit was rejected at both the Superior Court and Appellate Court levels.